The BG-235 unit is each equipped with 1 MicLine input and 2 Line inputs and also include an MOH Out. For installation ease, the rear-mounted terminal blocks are removable. DIP switches are provided to enable quick settings. A ZONE 2 OUT provides system expansion capability when needed. Users BGM market demands include affordable, mixer amplifiers optimized for simpler applications that will not require paging andor MOH Out features. A wider scope of operation can be gained by combining BG and BA to achieve full 2- channel broadcasts. The compact and attractively priced BG and BA Series make it easy to provide ideal BGM services wherever desired as well as help to reduce system costs due to the significantly less time required for system installation and set-up. 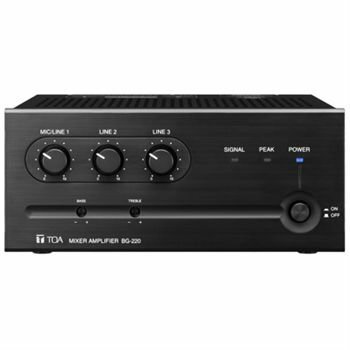 Affordable and compact amplifiers designed for background music and paging applications. Ideal for mid-sized environments including bars, retail outlets, classrooms, restaurants etc. 2-channel broadcasts possible for system expansion as needed through MOHZONE 2 output on BG Series amplifiers. Tamper-proof bass and treble controls preserve system settings. Security knobs for volume control included. If you have any questions about this product by Toa, contact us by completing and submitting the form below. If you are looking for a specif part number, please include it with your message.